Like those Snickers commercials allude to, when you're hungry, you're not yourself. Case in point: Mid-Sunday evening, the family and I standing in the brand-spankin' new McCandless Crossing Trader Joe's in Pittsburgh's North Hills. Nice store, grand opening weekend, it's kinda busy, we're getting the lay of the land, and all of us are h-u-n-g-r-y. All we want is an easy dinner, but we can't figure out what. M, our increasingly rambunctious two and a half year old, wants "nuggets and mac and cheese." Easy enough for her...but we eat that way too often to have that sound palatable for us. For whatever reason, I have a real hankering for onion rings, but they're nowhere to be found. Sandy's eying up the wraps, as am I, but they're pretty well picked over. We don't feel like pizza. We don't want to put much of any effort besides maybe roasting some veggies into dinner. Nothing frozen catches our eye. And the rumble in our tummies just grows and grows. 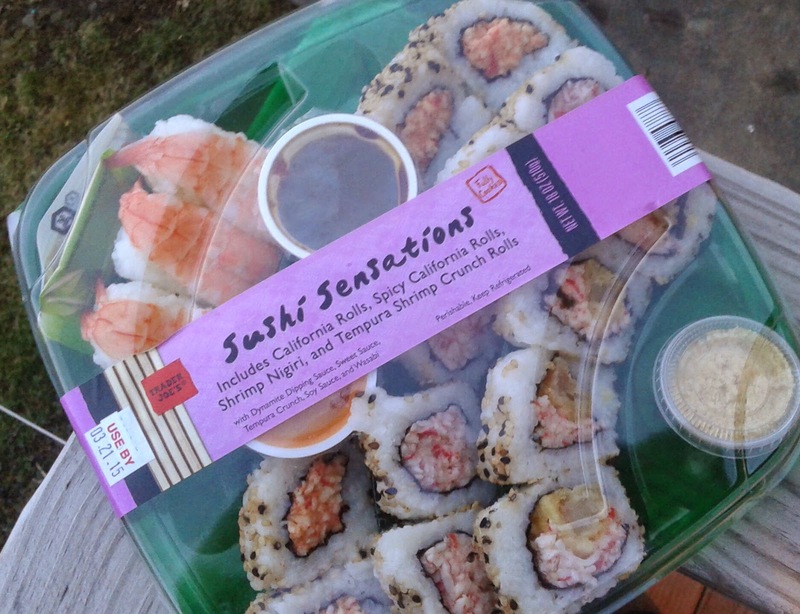 Listen, I have no idea what propelled me to even consider Trader Joe's Sushi Sensations. It's not that I'm against sushi. It's just that I've never heard anything good about Trader Joe's. Google "worst things to buy at Trader Joe's" and their sushi will almost always be mentioned. Years ago, in an article on The Daily Meal, I even said I never, ever wanted to try their sushi. Yet, here it was, in my hand, mulling it over....and even more amazingly, Sandy even said she'd eat some with me if we also got her a buffalo chicken wrap as a back-up. I've never seen her near sushi in the seven-plus years we've known each other. This was going to be an interesting night. Well...there are some positives. I guess. In true amateur foodie-hack fashion, I'll admit, I'm neither a huge sushi fan nor anything close to an expert. But even I could tell this wasn't exactly top-notch fare. There's four types of sushi laid out for sampling here: Shrimp Nigiri, California, Spicy California, and Tempura Shrimp. There's also some dipping sauces: a slightly spicy "dynamo" (not to be confused with the juice), some sweet, some wasabi, and a packet of soy sauce, as well as a small bucket of crispy Panko bread crumbs. The nigiri were reasonably okay, though nothing special, as well as the shrimp tempura. Some common complaints regarding TJ's sushi is the quality and texture of the rice - there wasn't too much (if any) sliminess present, and the shrimp had a good firm texture and taste. Each paired well with the variety of the sauces (although we skipped both the plain soy and the wasabi) and the breadcrumbs also added a nice, little touch. If those were the only rolls in there, we would have been reasonably fine with dinner and given a middling to solid score. But...the California rolls. Ugh. This is what California rolls are supposed to look like. These TJ impostors? Not close. Instead, the filling and the insides looked like some sort of cross between seafood salad and cat food - just a mishmash o' mush shoved inside some seaweed and rice. And I mean "mush." I didn't realize that the sticker with the nutrition label and ingredients was missing, and I can't find a picture of one online, but the filling tasted like all sorts of fake seafood-type junk smushed together. If there was a shred of authentic seafood in either one of those rolls, I;d be shocked. The "spicy" and regular had no discernible taste difference either. Sandy took one bite of one of them and nearly spit it right out for the texture being so offsetting. I'll admit that I was able to eat the rest...I must've been really, truly hungry and the sauces and breadcrumbs helped cover a lot. For a couple deliriously hungry sushi novices like us, the Sushi Sensations platter made a somewhat passable dinner, but barely. This is what you get when you pay $6.49 for a large sushi plate - we should have figured and gone for something else. At least I can say that I've overcome my fears and tried it out, all to say you'll probably want to stay away. This is not going to be purchased again. Oh I agree, but it'd be nice if, at least in this case, they made an honest attempt. I'd disagree about your blanket statement on Asian foods. Their kimchi, which they haven't offered in a while, was some of the best I've had that wasn't homemade, probably because they sold it in a sealed bag rather than a jar. Non-middle American here, who goes to K-Town in NYC for kimchi at least twice a month. I remember trying their sushi and I think 3 is a generous score. Do I recall a ranch like dipping sauce?? Ranch. With Sushi. Never again will I try store bought sushi if there isn't someone on-site choppin' it up fresh. Yeah, might be a little generous, but since we ate the whole thing (somehow) I couldn't justify going zero or 1. Hunger is a weird thing. I tried TJ's sushi once and it was, hands down, the worst thing I've ever eaten from the store. I think your 3 rating is generous. I've had worse - their turkey meatloaf muffins? Ugh. But yeah, this definitely wasn't all that good. Yes I agree with everyone else...3 is very generous. I'm not sure why they keep getting rid of their good products but the sushi sticks around!! Who is buying that stuff??? Why is it so hard for them to make good sushi? Okay, maybe I'm a bottom feeder, but I LIKE their Sushi Sensations! You get what you pay for, so look at the price and lower your expectations accordingly. If you ordered this much sushi in an upscale Japanese restaurant, you would be paying upwards of $50, less tip. Low end sushi is not for everyone, but it works for me. BTW, it makes my wife gag just to watch me eat it, and she LOVES sushi. I'm glad you get it it's not fair to rate food only on their appearance and say that it's okay but then say it's awful like it's really not bad texture wise it's not the best but overall it's fine they give you spicy mayo and sweet sauce with the crunchy crumbs and soy sauce with wasabi?? The reason it's not pureed like a regular roll is because it needs to last longer or esle it goes bad too quickly and that's money down the drain. Yes the rice and seaweed is not the freshest but what do you expect to get at an American based grocery store for 7.00 like I think it's decent quality with the quanity for the money like I'd at least give it a 5 out of 10 because of the deal. Almost made this mistake today, happened to see this post on a quick Google search. Thanks!